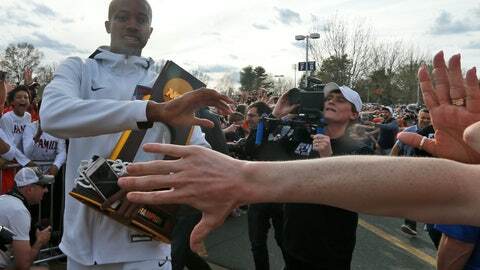 CHARLOTTESVILLE, Va. (AP) — Virginia’s national champion men’s basketball team returned to campus Tuesday and was greeted with a hero’s welcome. A throng of several thousand fans serenaded coach Tony Bennett and the Cavaliers, many in the crowd sporting newly acquired T-shirts celebrating the first national basketball title in school history. The Cavaliers won the title Monday night, defeating Texas Tech 85-77 in overtime in Minneapolis. The crowd chanted “U-V-A, U-V-A” as police motorcycles escorted the busses carrying the team into the parking lot of John Paul Jones Arena. The players and coaches walked down a path set off by barricades, high-fiving fans on their way to a podium. Virginia post player Mamadi Diakite drew huge cheers when he got off the bus holding the national championship trophy high above his head, and the crowd chanted “Tony, Tony” when Bennett emerged. Kyle Guy, the Final Four’s Most Outstanding Player, told the crowd he and his teammate never wavered in their belief that they could win the championship, ever after last season when, as the top overall seed, they became the first No. 1 seed to lose to a No. 16 seed. Virginia’s players were reminded of the loss all season, but felt like they answered their critics in the best way imaginable. “I don’t think Hollywood could have done a better job with the ending,” Guy said. Seeing fans lining the streets on the route from the airport to the school’s arena, Bennett said, helped him realize how much the victory meant to the community, even if he hadn’t quite had the chance to let the magnitude of the last 24 hours fully sink in. “That’s one of the pure, good things about sports, how it brings a community together,” he said. Needing overtime to win the championship was much like Virginia’s two previous games in the tournament. The Cavaliers needed a short jumper by Diakite to send their quarterfinal game against Purdue into overtime, and then Guy drained three free throws with 0.6 seconds left against Auburn to give the Cavaliers a 63-62 victory. The finale, then, was something Virginia fans came almost to expect, longtime Virginia fan Charlie Sallwasser from nearby Crozet said. Sallwasser’s T-shirt listed the five pillars — humility, passion, unity, thankfulness and servanthood — Bennett tries to get his program to embody. Appreciation was one of the reasons the 36-year-old from Crozet, Virginia and his wife attended the welcome-home celebration. “It’s an identity of the program and you can tell it’s something they’re proud of and we can all kind of get behind that,” he said. Groot came from Scottsville, Virginia, about 20 miles away from campus, and said watching Virginia take command in overtime was much easier than watching regulation. “Regulation was a lot of beer and a lot of cuss words,” he said. Roger Creager, 64, came from Richmond and stood along the barricaded pathway wearing a national championship T-shirt and with another draped over his head, protecting him from the sun. “I bought seven of ’em,” he said of the shirts. A graduate of Virginia’s law school in 1982, Creager said he’s become particularly fond of the Cavaliers the last two seasons. He said he has seen every game the last two seasons, watching them at restaurants or sports bars around Richmond because he doesn’t have cable at home. “I just love these guys,” he said, and he took issue with the narrative among some that Virginia’s defense-first, patient offensive style is setting the game back. And he had the t-shirts to prove it.